Why am I so in love with massive phones? Android, I'm sorry. I'm back now. Seriously... this was considered small? As a journalist, you're meant to stand by your convictions. But I'm about to do an amazingly blatant u-turn. Despite writing last week about how much I've been looking forward to getting my hands on an iPhone 5S, I've done the unthinkable in the eyes of many Cupertino disciples. I've cancelled my pre-order. That's right. Who cares? Keep your 64GB of self-righteous goodness to yourself. I'm going large. When it comes to people, the fact they come in all shapes and sizes is brilliant... and I've become rather entranced by a larger model myself. Her name? The Samsung Galaxy Note 3. I may have cheated on you, Android, but I didn't get physical with the iPhone 5S. I promise. It was just lust. We never even got to touch. She was too elusive. I've used the Note phablets before. I know they're not to everyone's taste. They're big. Very big. There's no getting away from that and I'll be the first to say I was sceptical. Who on earth would want a device this size with a flashy stylus? Erm… That would be me now. It's amazing how attitudes have changed. Ten years ago, mobile makers were on a mission to get as tiny as possible. 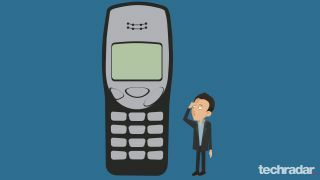 The Nokia 3210 was considered small for its time (remember, size is relative. That's my excuse and I'm sticking to it...) but it got shrunk out by the Nokia 3310. And then the Nokia 8210 and 8310. I'm only mentioning Nokia here because back then, there really was no serious competition. Motorola was in second place and its devices were hardly small. Ironically, Samsung was yet to launch. And when it did with the dual-screen A3001, it had a teeny size and novelty on its side. But that was it. It was rubbish. Fast forward and so much has changed since the smartphone was 'invented' by Apple. I've actually sat with iPhone-preaching friends who've played with my Galaxy S4, and despite their hatred of Android (stolen product, thermonuclear, etc etc), they do tend to say the same thing each time: "Oh yeah, but I do love the size of the screen. I wish Apple would do this." Take Note, Tim Cook. The question though is, where will it end? Looking at the specs, given what we now do with a phone or a phablet, the power is starting to max out. Add any more grunt and you probably wouldn't notice it. But what about size? Sony prefers big too. It's launched the Ultra, and pretty soon HTC and LG will have joined the oversized smartphone party, crashing through the front door with a half drunk bottle of plonk and begging for acknowledgement. Will these things keep on growing and growing until they can't get any bigger? Remember that the Samsung Galaxy Note 8 is eight inches and that too can make phone calls. You really would look like a prize turnip doing that, but it's an interesting thought. I wasn't on board with the Note. The Note 2 only made me feel a little warmer. So why on earth should the Note 3 suddenly swing my head from the beauty of the iPhone 5S? I can't really answer that... and that's why I love smartphones, the pure idiocy of fanboyism. Just know that if you see me clasping a Galaxy Note 10.1 to my head and shouting at it, you have my permission to call my mother. I'll need all the help I can get.